Navigate, take control, and enjoy an unprecedented level of built-in functionality with NSS evo3. SolarMAX™ HD display technology offers exceptional clarity and ultra-wide viewing angles, combined with an all-weather touchscreen and expanded keypad for total control in all conditions. Cruise confidently with ForwardScan sonar, or fish easier with StructureScan® HD imaging and dual-channel CHIRP-enabled Broadband Sounder™ technology. Built-in Wi-Fi enables access to GoFree® online services, and delivers smartphone monitoring and tablet control to extend your display’s reach well beyond the helm. 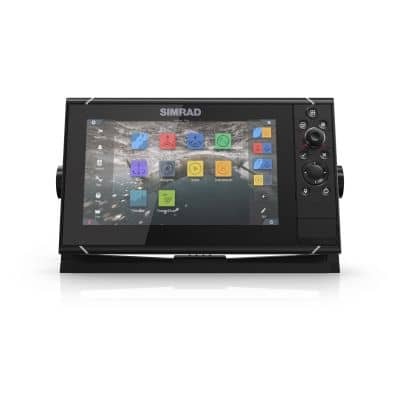 The NSS9 evo3 packs a high-definition 9-inch display into a compact form that’s great for centre consoles and other powerboats. Includes Insight charts. Sonar (inc. compatibility) Two 9 pin Xsonic Sonar ports. Sonar port 1: Single channel CHIRP, 50/200 khz, HDI. Sonar port 2: Single channel CHIRP, 50/200 khz, TotalScan, LSS HD, ForwardScan. Video 2 x composite (RCA connectors)video inputs. Optional video/ data cable required (P/N 000-00129-001).